A painting of Harriet Rushout, one of the celebrated sisters and society beauties known as 'The Three Graces' born to John Rushout, Baron Northwick of Northwick Park (1738-1800) and his wife, Rebecca is in Bonhams Fine Miniature Portrait sale on 19th November in Knightsbridge. It is estimated to sell for £8,000-12,000. 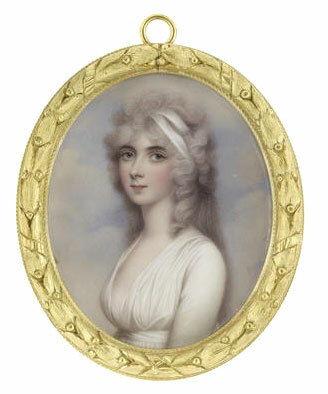 The portrait shows Harriet Cockerell née Rushout (d.1851), wearing a white dress and white bandeau in her powdered hair. The Henry Bone (1755-1834) preparatory sketch for this portrait, dated 1810, is housed at the National Portrait Gallery. Harriet married Sir Charles Cockerell, 1st Bt. on 13 February 1808 and the couple had a son, Charles Cockerell Rushout, 2nd Bt. (1809-1869) and a daughter, Harriet Anne (b.1812). It is easy to see where Harriet got her looks from as a portrait of her mother Rebecca, also in this sale as lot 102, is estimated to sell for £7,000 to £9,000. The portrait shows The Hon. 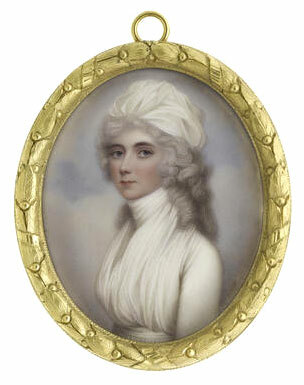 Lady Rebecca Northwick née Bowles (1740-1818), wearing white dress and fichu wrapped around her neck, her hair powdered beneath a white turban. Rebecca Bowles was the daughter of Humphrey Bowles and Hannah Hurst. On 3 June 1766 at Wanstead in Essex, she married John Rushout, MP (1738-1800), 1st Baron Northwick of Northwick Park. The couple had three daughters, Anne (d.1849), Harriet (d.1851) and Elizabeth (1774-1862), and two sons. The sisters were renowned for their beauty and charm during their lifetimes and the sisters were painted together many times. 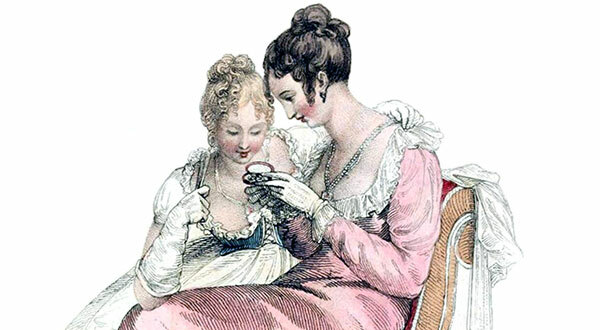 This 1810 fashion plate presents fashions from the period of the two portrait miniatures. To the left is a white Indian muslin walking dress featuring a Spanish vest and Flemish skirt, ornamented at the bottom. 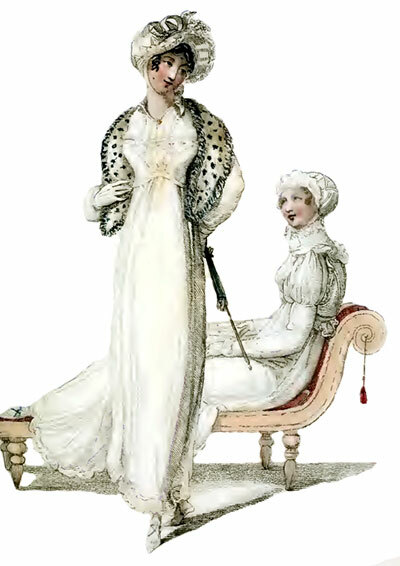 The Regency era dress is ornamented with needlework or appliqued lace, antique cuffs, a pointed collar and is fastened at the center of the throat with a topaz broach. To the right is a plain muslin round morning dress with long sleeves and an embroidered habit shirt. The muslin spencer jacket is without sleeves, very short, and trimmed round the armholes, bosom, and waist with lace. Jennifer Tonkin, Head of the Portrait Miniatures department comments: "Bone's triple-portrait of 'The Three Graces' is one of the most interesting and memorable miniatures we've auctioned in recent years and it remains to this day, the most recognisable image of the Ladies Rushout. This idealised portrayal of timeless English beauty is represented here again in Bone's enamels of Harriet Rushout and her youthful mother, Rebecca and we're delighted to be featuring two generations of this notable family on 19th November."